How long is it since you’ve nurtured your own “Spark”? You know that special something that makes you feel really good, that ignites your passion, that you can lose track of time doing? If you’re lucky (lucky by choice, that is), your spark is your work and you’re earning your living doing what you love most. For most of us though, our sparks only come out of the closet as hobbies, and kids tend not to be very hobby-friendly – at least not when they are little. Tired, stressed and busy, we often forget to fit into our lives the things we most enjoy. We give our best (i.e. all) to our kids, looking after their every need, while ignoring our own. We get out of the habit of doing things for ourselves. That’s OK for a little while, especially for the first few years, but if it becomes our standard way of life, we can soon lose track of who we really are – as individuals, and often also as a couple. We can easily lose touch with the incredibly interesting, active people our partners were originally attracted to. It’s time to create some better habits… ones that have our own sparks built in. After all, you can’t nurture and inspire your children to develop their sparks, if you don’t understand and enjoy your own. Here are some good reasons why you should nurture YOUR sparks! We all know kids learn more from our actions rather than our words. Seeing us doing things we love encourages them to do the same. It can also open up the conversation with our kids about sparks. Plus, as sparks are often inherent talents (and therefore potentially heritable), you are exposing your kids to an activity that they may end up also loving. A friend of mine recently told me that her 8yo son was completely taken aback when he learned that she ran her own business, creating websites. It turned out his Mum was more than “just a mum!” Wow! Let your kids know that you are a fabulous knitter, or can write poetry, or play the harmonica, or whatever… it makes them feel good to be the child of someone so cool and talented! It took me a long, long time to accept that as far as craft projects went, I was probably never going to get the Munchkin to help. It’s just not his thing. It is, however, mine… especially if there’s some designing involved. So for projects like the Viking Shield and Runes, I let him come up with the ideas, while I do the pretty graphics! I LOVE it, and he’s not pressured to do something he doesn’t enjoy. Win, win! Working together on projects is incredibly rewarding, especially when you play to each other’s strengths. It gives you time to teach, but also to learn. Plus it’s nice just to hang out together. Better yet, you might find a way to earn a living from it! My life is full of wonderful women (yes, they are pretty much all women, sorry guys), who have decided to earn a living doing stuff they love. Tired of playing big business games, they have gone out on their own, and are following their dreams and nurturing themselves, while having the flexibility, time and energy their kids need at the same time. Maybe it’s YOUR time to rediscover your passion and purpose ­– and go for it! It’s not all about the kids – although of course, happy parents = happy kids… that sort of thing! Doing something you enjoy doing for the sake of it is good for YOU. If it helps you unwind, feel more like your best self and gives you joy, go for it! Our kids do need us to be our best selves, and taking the time to look after ourselves and do the things that give us the greatest pleasure is so important. So think about your sparks… take some time to tap into that 12 year old or 8 year self… what did you love to do, what did you dream about, what were your good at, what did you wish you could do all day? In an epiphany rather like my own “fall from grace”, journalist Carl Honore recognised that it was time to slow down when he caught himself getting excited about discovering a range of 1 minute bedtime stories to read to his young daughter. This realisation sent him on a path that was to change his life. Through his books, “In Praise of Slow” and “Under Pressure”, Carl is now one of the chief spokespeople for the Slow Movement – a movement that encourages us to stop rushing through life and start savouring it instead. While “Slow Parenting” may not be your final aim, it’s worth taking some time to think more deeply about what you truly want in life. For most parents, having the time to spend with our kids, to enjoy their company and help them reach their full potential are high on the list. To be able to tune into your kids enough to identify and nurture their sparks, taking life slowly, at least some of the time, is vital. Kids operate at kid-pace. They stop and look at things. They choose to focus on what interests them. They live very much in the NOW. Knowing you can live at kid-pace too is incredibly satisfying and nurturing… not only for your kids, but for you too. Here are some suggestions for helping you move towards Slow Parenting. Remember your lives BC (before child) when life seemed stretched out endlessly before you? What did you and your partner dream of doing, achieving, being? What about when you were a kid? What were your big dreams then? Sometimes we get so caught up in the hustle and bustle – taking whatever path that comes up next – we forget where we were intending to go. Did you dream of living in the country, running your own business, travelling around the world with only a backpack? All of these things are possible – yes, even with kids! This is related to point 1 above, but is less about what you want to DO, and more about how you want to FEEL. Maybe some of those dreams are no longer your desires… you’ve changed, and that’s OK. Knowing exactly what your core desired feelings are, helps you prioritise, make better decisions and seek out more meaningful life experiences. I find Danielle LaPorte’s The Desire Map* is a great help… it takes a few hours to get through if you do it in one sitting, so make sure you plan some good, uninterrupted time to yourself. It’s worth it! *Affiliate link. Do you really, really need to work the hours you are currently, or is this something that the business world has imposed on you? How many hours would you acually like to work? Are you working in a job that is paying a lot less than you are worth? Do you really need the big house in a trendy suburb with a massive mortgage, or would a smaller house in a different place (country, town, suburb etc) be more appealing, if it means you could spend more time with your kids? Are the local schools able to offer a similar standard of education as your private school? What else do you spend your money on? Do you always have to have the biggest TV, the latest smartphone, a computer in every room? Are you buying “stuff” for your kids to make up for your lack of time? Are you paying a fortune for outside activities, only to feel constantly rushed, driving your kids from one activity to another? Yes, some families DO need two full-time incomes just to survive, and yes, if you’re a single parent your choices may be more limited. Only you can decide what is right for your family – but at least ensure your financial situation is a decision, not an imposition! It’s important to remember that a lot of our busy-ness is self-inflicted. Think of all the things you have currently said “YES” to, when you really wished you’d said “NO”. Maybe you were too scared to be seen by your employer as lacking in ambition. Maybe you didn’t want to appear selfish or arrogant. Maybe you wanted to be accepted into a group or community. Go back to your core desired feelings. If something doesn’t make your heart sing, say NO. Remember, saying NO creates room for all the wonderful YES things! It will also exercise that muscle ready for when you need to say NO to your kids! If it’s not beautiful or useful, get rid of it! Sell it, donate it to the local op-shop, give it away to someone who would love it more than you do. Encourage your kids to do the same. You’ll be amazed how much lighter you will feel! And you probably won’t have to spend as much time tidying up! Choose quality over quantity. Ignore fashion trends and go for classics. Before you make a purchase, stop and think, “Is this really a necessity (e.g. Munchkin’s school shoes… every term! ), or am I filling some kind of emotional need”? Say no to your kids’ requests for the latest trends (or get them to use their pocket money for them – they will quickly learn the value of money). Choose toys, games and art materials that will encourage their imagination ­– or better still, find things from nature or your declutter collection that you can use instead. Remember that this is all just “stuff”! You might also like to consider (and educate your kids if they are old enough) that all “stuff” has to come from somewhere, and that has an impact – on our natural resources, on the greater environment, on the people who manufacture it. Once you factor some of these into your decision-making you may realise you don’t really need it after all. Don’t feel you have to give up the career you love. Surround yourself with beautiful things if they bring you joy. Indulge in little luxuries now and then. However, if you feel that life is rushing by at the speed of light, and you just wish you could Slow. Down. A. Little. – know that there is always, always a choice. Recognise that you have the power to live the life you dream about… maybe not right now, but soon… and start moving towards it. Next up… Before you can nurture your kids’ sparks you need to nurture yours a little! After rescuing a friend’s henhouse about three years ago, we finally have chicks! Three gorgeous, little black and yellow fuzzballs. At least that’s what they were two weeks ago. Now they’re starting to get a bit scrawny and scruffy around the edges. 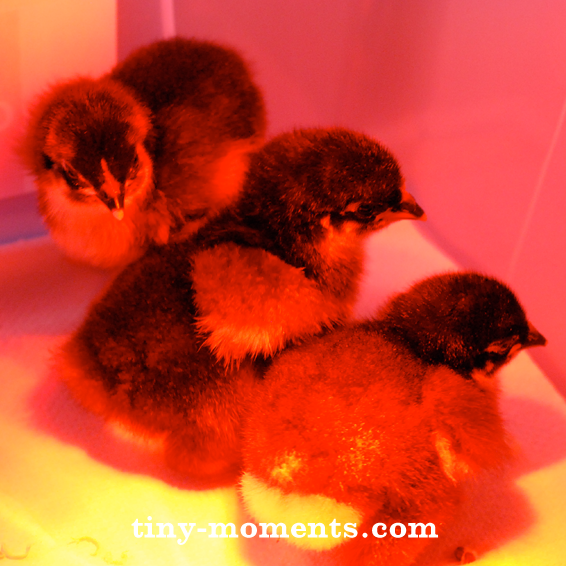 I can’t believe how quickly they grow – and how much they EAT! Chickies are Awesome! and it’s sister song, Everything is Chickies! Considering this was only a fortnight’s work, I am definitely expecting others over the coming weeks! Meanwhile, I’m hoping that God (or any other deity for that matter) will listen and take heed. I’m also hoping that Hubby’s tendency for over-engineering will be enthusiastically applied to the building of Foxy Fort Knox, just in case God is otherwise occupied!